She wrote those words while in Ethiopia, home of the Banna and 81 other language groups, many of which do not have Scripture in their mother tongue. The Banna and another ethnic group, the Hamer, speak the same language, often referred to as Hamer-Banna. 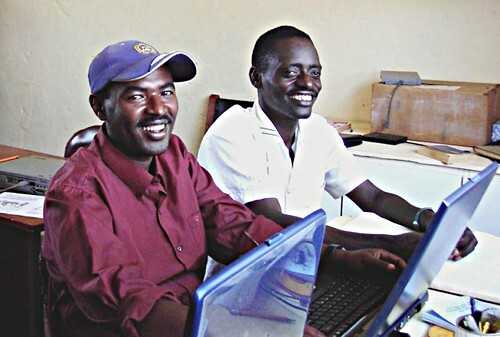 The number of people having access to Scripture through the Banna translation is about 70,000 to 100,000. 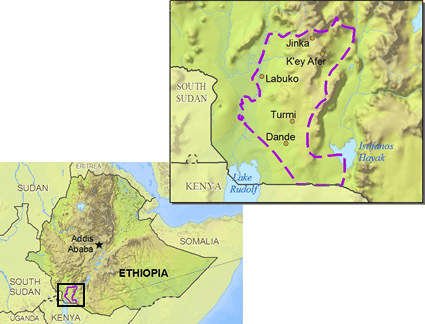 The Banna and Hamer live in the remote, inaccessible, undeveloped highlands of southwest Ethiopia, a rugged landlocked country of East Africa with a population of 74 million. Related Banna families live together in camps which they move to follow their grazing herds of cattle, sheep and goats during the dry season. At a camp site, women and children live in family tents placed in a circle. The men and older boys sleep on cots near the cattle, which they bring into the center of the camp for protection at night. Many Banna plant fields of maize, sorghum, sesame and beans during the rainy season. The Bannas and neighboring language groups are animists. They believe that natural objects such as trees and rocks have spirits. They also believe in jinnis, spirits capable of assuming human or animal form. The Banna may attribute sickness, infertility and death to the resentment of a deceased relative. They appease the relative by the offering of a sacrifice. How did they receive the Gospel? Evangelists from the highlands of Ethiopia have been living among the Hamer and Banna since the 70s. 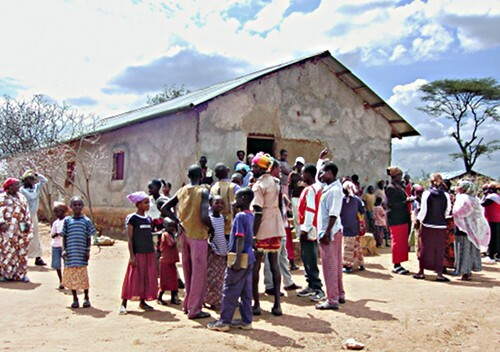 A church planted among the Banna grew but the people needed God’s Word in their own language. A few excellent church leaders have nurtured the believers, now about 1,000 strong. SIM built an elementary school for the Banna people at Alduba in the 1990s. Most of the students were children of believers but the literacy rate is still around 3%. SIM also built a clinic in 1988, which helped open people’s hearts to the Gospel. By the mid-90’s the need for Banna Scripture led to the creation of an SIM translation team, with Carolyn Ford as translation consultant. Although she went to teach math and Bible at a SIM high school in Ethiopia in 1973, God quickly led her into Bible translation. She says, “I helped with the translation of about 45% of the Old Testament into Aari before handing the project over to another organization. The Banna language is somewhat related to Aari.” Because of this linguistic similarity, the team could use a computer program called CARLA (Computer Assisted Related Language Adaptation). It enabled them to develop a rough draft of the Banna Scriptures from the Aari Scriptures. Starting with this rough draft, Ayke, Getu and Dawit revised it many times seeking a natural flow. They replaced computer language with common figures of speech. SIM linguist Donna Clawson worked alongside the translators to train, advise, and encourage them. When one or more books were ready, Carolyn Ford traveled to meet with them and check that their translations accurately interpreted the original text. The team printed each New Testament book after it passed the consultant’s check. They would use it for literacy and Bible study while awaiting publication of the full New Testament. The project also produced a variety of literacy materials and trained some Banna Christians as literacy tutors. 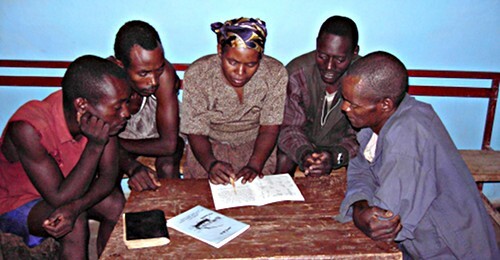 As the translation neared completion in 2010, another SIM worker, Tabitha Cox, contacted MiDi Bible to inquire about printing the complete Banna New Testament. Early in 2012, a contract was signed. Orthography delayed fulfillment of their agreement. In October of 2012, Carolyn wrote, “… just as we were thinking we could send the manuscript for typesetting, we learned that the Ministry of Education here plans to produce textbooks in the Hamer-Banna language. 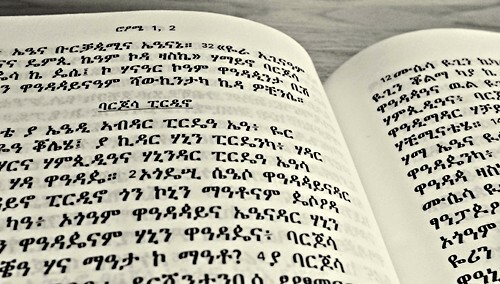 Unfortunately, from a human perspective, they have not yet decided what script they will use.” Printing had to await the government’s decisions about certain characters in the Ethiopian script. God answered prayer, although not on man’s timetable. At long last, officials resolved the orthography issues. Typesetting took place. Printing proceeded. Shipment followed. Boxes containing 2,000 Latin script and 1,000 Ethiopian script Banna New Testaments sailed to Djibouti in mid-February. 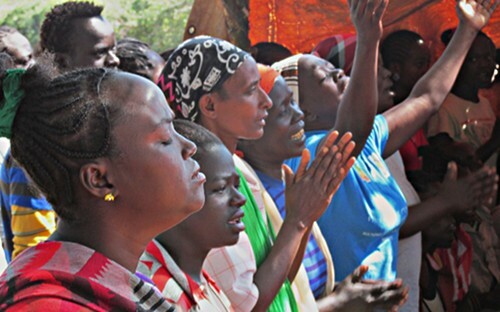 God answered prayers for safe arrival and transport to the Banna in Ethiopia. About a hundred people bought their own copies of the Banna New Testament as they celebrated its dedication on August 9. Please continue to pray that the New Testaments will be received and read with eagerness, and that God will work in Banna hearts. Translation work is difficult and tedious. When I joined the translation team, I had a full head of hair; now half of it has disappeared. People would accuse us of sitting all day in an office, receiving a wage to do nothing. God brought us through all the trials and blessed our family. He gave me favor with people. God has met all our needs. Our wives have as much of a part in the translation work as we do. If they had not been there to encourage us and care for our families we could not have done the work. Because our parents made the effort to see that we were educated and taught the Scriptures, there are many people involved in ministry. I praise God for Garsho and the other early believers. I think Garsho contributed more to the translation of the Banna New Testament than any of us on the translation team.